New Listing For 2018. This 2-bed Basingstoke apartment makes for a great place for business and leisure visitors to stay in a location that’s close to local amenities and attractions, with easy access to much of southern England (including London) via rail or road. Ideal for people visiting Basingstoke for work or pleasure, this 2-bed modern city apartment is new for 2018. And it really looks and feels it. Smartly presented throughout, which feature will most appeal to you most? Could be the shiny wooden flooring, the open plan living room / diner / kitchen, or the comfy zip and link beds that give you flexible sleeping arrangements – you get to choose from one double and one single or three singles. The main living area sports a pair of sofas that are great for relaxing on and watching the widescreen TV. There’s also a dining table in here with room enough for working on or eating at. The L-shaped kitchen features brand new worktops, units and appliances, giving you everything you need to cook meals for yourself and fellow guests, and for keeping your clothes clean. The main bedroom features a professionally presented double bed, with its big window letting in lots of daylight. The second, single bedroom is ideal for a work colleague, or if there’s a child over 12 in your party who’s happy to sleep alone. Here’s where you can explore Hampshire life in years gone by. Wander cobbled streets exploring old style shops, meeting characters in costume, and marveling at the impressive collection of vintage cars. This venue is where you can catch comedians, see live bands, enjoy opera and classical music and take your seat for performances of touring theatrical productions. There’s good reason why Basingstoke is a popular place with visitors, whether their purpose is business or pleasure. Its location makes it easy to access London, the south coast of England and West Country by road and rail. The M3 motorway is close by, with easy access to Bournemouth, Portsmouth and Southampton to the south and London to the north. 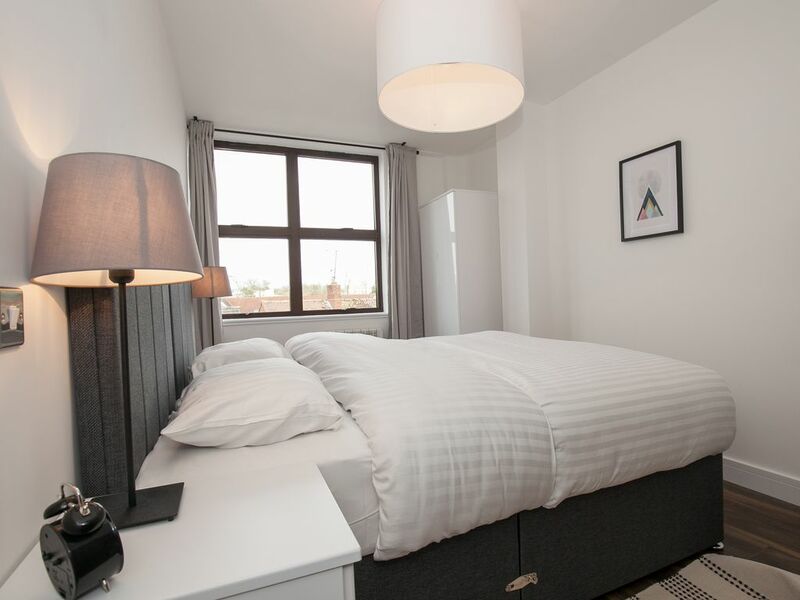 The train station (just 7 minutes away) connects you with the West Country, Reading, London and further afield places such as Birmingham, Manchester and Glasgow. So this 2 bed Basingstoke apartment is ideal if you’re planning to travel around the UK and need somewhere convenient to base yourself that offers great value for money. Closer to home, local bus services are ready to take you to places of interest such as Andover, Camberley and Winchester. And, of course, having a free underground parking space with the apartment gives you the option of getting around by car without having to worry about hunting for somewhere to leave your car that’s near to where you’re staying.